Financial Literacy has become a priority area across the world in recent years. In a complex and globalized marketplace, a myriad of products is offered in the financial market, and the accessibility of products has also increased. This has made it imperative for individuals to be well equipped with the necessary financial knowledge and awareness to use their financial resources in an optimum way. The study examines the financial literacy of the people by using a questionnaire developed by the Organisation for Economic Cooperation and Development (OECD). The data were collected from 500 respondents from the state of Haryana. The findings reveal that only one-third of the total sample exhibit higher financial literacy. Although the majority of the people possess basic financial knowledge and exhibit positive financial behaviour, 57 per cent of the respondents lack a positive financial attitude. This suggests the need for the introduction of initiatives on the part of policymakers, which may be beneficial in changing the attitudes of the respondents. However, analysis of the socio-demographics suggests that certain factors may prevent persons from being more financially literate. In particular, low levels of income, income instability, and low age are associated with lower levels of financial literacy. The present study offers the first ever comprehensive insight into the financial literacy of the Haryana region. CHOUDHARY, Kapil; KAMBOJ, Samriti. 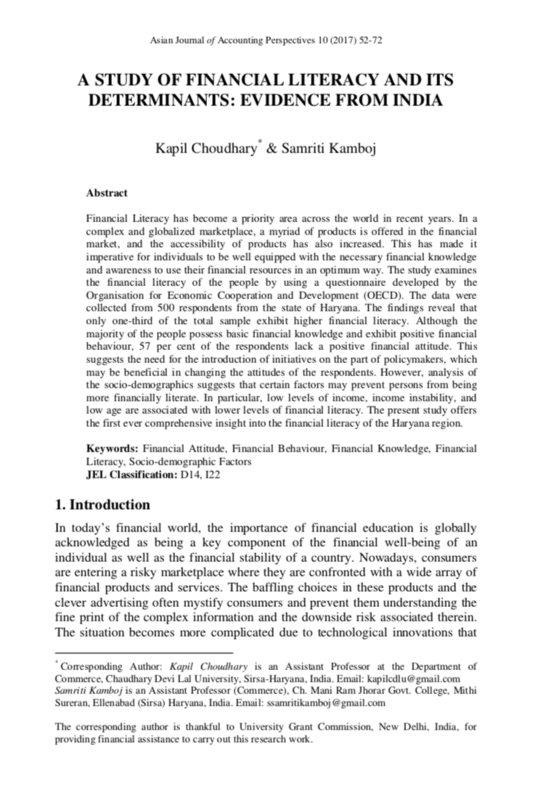 A Study of Financial Literacy and Its Determinants: Evidence from India. Asian Journal of Accounting Perspectives, [S.l. ], v. 10, n. 1, p. 52-72, dec. 2017. ISSN 0128-0384. Available at: <https://ajap.um.edu.my/article/view/11280>. Date accessed: 20 apr. 2019.